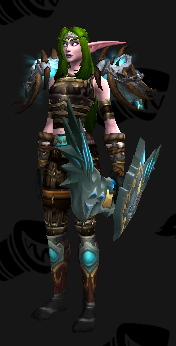 Okay, I love this mail transmog, but those shoulders are going to be a pain in the neck. Wyrmstalker’s Spaulders is a Cataclysm raid drop — easy, right? Nope, they’re a Cataclysm raid finder drop. That means if you’re already 90, you’re screwed — that is, until Warlords of Draenor makes old LFR content available to transmog hunters. If you can’t wait, other colours of the same model are available (purple or red), but a straight substitution isn’t going work with this design. The chest, legs, helm, and gloves could stay, no problem, but you’d want to tweak the gloves, belt, and weapon to accommodate the red or purple — whatever your poison. If you don’t feel like thinking too hard and you like the look, let me know and I’ll do the heavy lifting for you. This entry was posted in Black, Hunters, Mail and tagged blue accents, grey accents, hunters only by Cathedral. Bookmark the permalink.